Before the American Flag as we know it was designed to represent the United States, several other flags were created to represent our country and its storied history. Many of these flags were designed with our struggles for freedom in mind, showcasing the many efforts that were made to escape British interference. Dozens of local communities joined in on the effort to represent the spirit of rebellion through flag design and display. Schenectady NY was one of those communities. The Liberty Flag of Schenectady began as a homemade flag with the word ‘Liberty’ sewn on both sides. It was made of dark blue material (likely silk) with white applique letters sewed on with a white running stitch. While many flags are rectangular, Schenectady’s pre-revolutionary Liberty Flag was designed as a square, giving it a unique and distinctive look. The flag was first displayed in January 1771. It was hoisted onto the top of a 20-foot tall liberty flagpole in the center of the city of Schenectady, in what is now considered the stockade district. The Liberty Flag was originally raised to show that the original Dutch settlers in Schenectady did not believe that the more recently arrived English settlers had rights to property within the area. Approximately three years later in 1774, the Liberty Flag was hoisted again in Schenectady, this time in a new location. A second Liberty Pole was erected on the corner of Church and Union Streets, and the flag raising was attended by approximately 50 men. While it was thought that this event may turn into some type of riot, no violence or damage occured. In 1776 and 1777, the Liberty flag was also reportedly carried during the American Revolution by the first New York line regiment, which was largely made up of residents from Schenectady. The flag also became a symbol of the Sons of Liberty and was replicated numerous times in various colonies and communities to show disagreement with how settlers were being treated by Great Britain. A pre-revolutionary version of the Liberty Flag is housed at the Schenectady County Historical Society. The flag is believed to have belonged to Nicholas Veeder, Schenectady’s longest living veteran of the revolution who died at the age of 101. It was gifted to the Historical Society years after his death. The Liberty Flag isn’t seen as often today, largely because the American Flag is now used to represent the entire United States. However, it is still an important artifact in the history of Schenectady and the US. Replicas of the flag are used by historical reenactors, and some people still display the flag to this day. Want To Purchase Your Own Liberty Flag? At Gettysburg Flag Works, we recognize the local and historical significance of the Liberty Flag. We’ve created a version of the flag that’s beautiful, durable, and inspired by the original. Check out our Liberty Flag here! 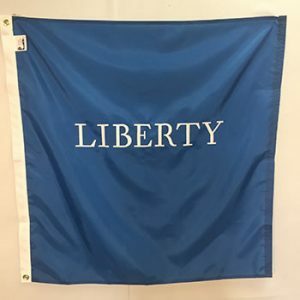 Featuring a square shape, a rich blue color, and creamy white lettering of the word “Liberty,” our Liberty Flag is a great way to show your American pride and celebrate Schenectady’s local history and impact. Interested in purchasing a Liberty Flag? Shop now and purchase one here! We also carry a wide selection of historical American Flags, as well as historical battle and war flags, including others used in the American Revolution. Can’t find the historical flag you’re looking for? We can create it for you! Browse our custom historical flags portfolio for ideas! Have questions about any of our flags? Don’t hesitate to give us a call at 1-888-697-3524 or contact us online. We’d be happy to assist you!